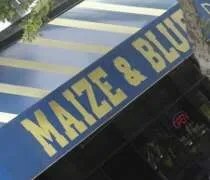 The Maize and Blue Delicatessen on South University at Washtenaw in Ann Arbor. I’ve mentioned many times on this blog that I’m a late sleeper. Most days, it well into the late morning before I get out of bed. In my defense, it’s usually after two a.m. before I go to bed. That makes days when I have to get up even harder and nothing has been more of a challenge than I had this morning. I had to be in Ann Arbor, ready to work, at five A.M. That means, I was out the door at about 3:30…an hour after I usually go to bed. I was able to change my sleep pattern for the weekend and actually slept all day Thursday and got up around midnight and just stayed up. When “lunch time” rolled around on the job site at a little after seven, I was starving. 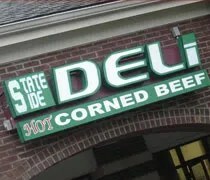 Ted-Dee's Sandwich Shop in downtown Lansing. After spending a little time at the Select Michigan Capitol Lawn Farmer’s Market, J and I were in the market for lunch. Since we were only a block from Washington Square, I suggested we take a walk and see what we could find. It my mind, I was already leaning towards a deli, but if J saw something she would rather have, I wasn’t going to complain. I’ve said it before, but it’s worth repeating, I feel extremely sorry for the businesses that have to deal with the CSO Project. We walked down Allegan from the Capitol and just walking in the area is a pain. Imagine if you have to drive. It’s not worth the hassle….and that pains me to say. As we rounded the corner on Washington Square, we followed the fence to a makeshift crosswalk in the middle of the street. 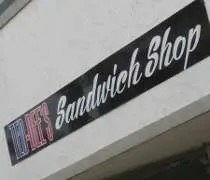 The good thing is the crosswalk leads right to the door of Ted-Dee’s Sandwich shop which sits near the intersection of Washington Square and Allegan Street. It’s not very often that J and I make appointments for the early afternoon, but today, we had something to do in Okemos around one o’clock. Our appointment wasn’t going to take long, so we decided we could squeeze lunch in after what we needed to do and before she needed to go to work. 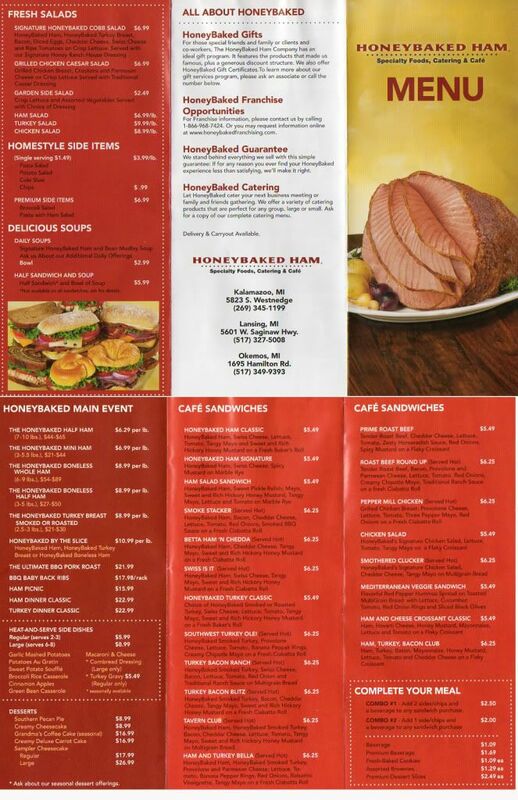 Since we didn’t have a whole lot of time, I asked the question, bar food or deli. She chose deli which narrowed the choices to Panera or McAlister’s. Since I’ve only eaten at a McAlister’s once and she never had, I chose the latter. 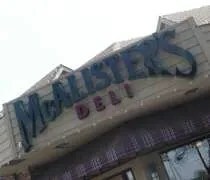 McAlister’s Deli is a chain of restaurants founded in the late nineties in Oxford, Mississippi. 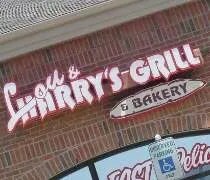 There are three locations in the Lansing area. Since we were in Okemos, we went to the Marsh Road location which is near the intersection with Grand River Avenue in a small strip mall. Another one of those days were I was up long before I wanted to be. I had to work downtown again fairly early. As I was wrapping things up, I got a text from J. She was at a jewelry store in Frandor getting her ring re-sized (I was off by half a size). Since she had some time to kill, she asked if I wanted to meet her for lunch. I was just going to grab something on Washington Square, but meeting J sounded like a better idea. When I got to Frandor, she was waiting for me and suggested Panera. 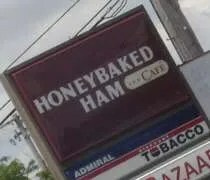 I like Panera, but there’s still places I want to try in the area. Instead, we headed out of the shopping center a little way to a little strip mall just on the other side of the East Lansing city limits. 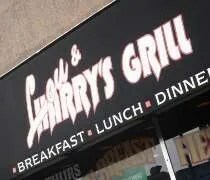 Lou & Harry’s Grill has three locations in the area. Two are in East Lansing and the third is Okemos. The store we hit up for lunch was the Saginaw Street store. The roads in this area are really messed up and if you’re not paying attention, it’s hard to get around. Coming out of Frandor, we had to take a left on to Coolridge Road to get into the parking lot. I’m not an expert on New York deli’s. In fact, I’ve never eaten in one. I’ve only been to New York City once and that was a quick weekend trip to see a baseball game in old Yankee Stadium with my brother. We ate at Bobby Flay’s Mesa Grill, La Famiglia Pizza in Times Square, and a bar near Madison Square Garden. We were going to find a deli to get some corned beef but we never did. 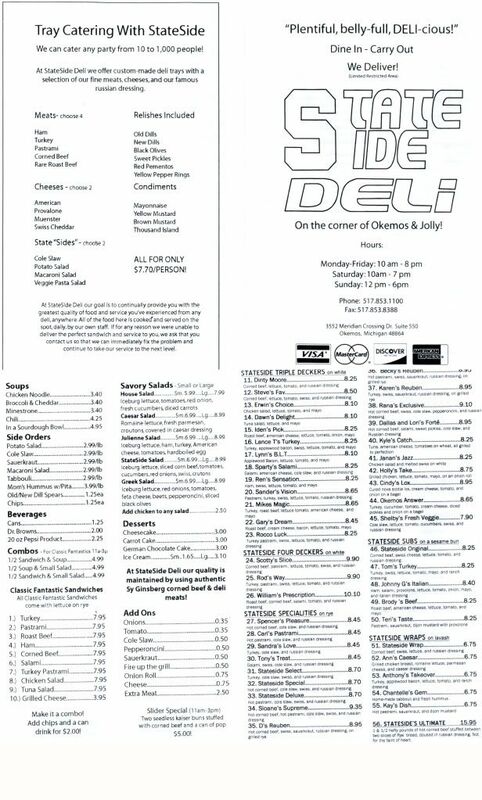 I read the message boards at Chow.com quite often and the most popular question about dining in Lansing is “Where can I find a New York style deli?” Recently, the answer has been State Side Deli. I’ve heard a lot of good and only one bad, so I’ve been looking for an excuse to go. For the first time in about two months, I had a Saturday off. No work. No family in town. No trips to Chicago. Just a Saturday afternoon where J and I could do whatever we wanted. What we wanted to do was go to Walmart. J had a list of things she needed and can usually get cheaper at Walmart. Since there’s really not one close to us, we were going to have to drive somewhere. Since I there was a Walmart in Meridian Township, I chose that one so I could finally stop at that deli everyone’s been talking about.